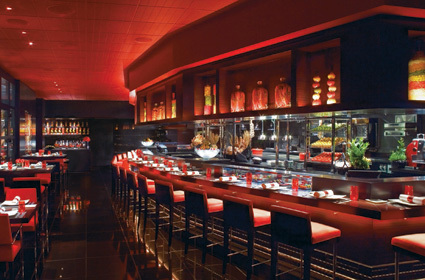 All whom dine here at the MGM Grand pour over the perfect combination of Joel Robuchons gastronomic feats and culinary artistry. This is not food as fuel, food to bolt down greedily (even though you may want to), but to slowly savor. Pay attention as you chew, and notice how many layers of interest are revealed. Great care is taken in choosing and combining ingredients, to create not fuss but both surprise and a sense of rightness. Exquisite, superb -- name your superlative, and it's been levied toward this remarkable restaurant. Chef Robuchon is not personally in the kitchen that often, but he has entrusted this kitchen to some of his former top employees, and if they stay (no implied criticism, merely a reality of the restaurant world), so should the quality. The menu changes frequently, with many key ingredients flown in daily from France. And the service reminds one that Michelin ratings take that into account, too. None of this comes cheap. Could it possibly be worth it? When restaurant critics claim they would spend their own money in order to dine here, quite very possibly yes. Look at it this way: You can easily lose the cost of a meal here in 15 forgettable minutes at a blackjack table (not that we recommend you do just that) or you can spend 3 hours slowly enjoying a meal, storing up much more pleasurable (presumably) memories.